"Mongolian Buddhism" redirects here. For the branch of Buddhism which the Mongols adopted from Tibet, see Tibetan Buddhism. Tibetan Buddhism combines Vajrayana with indigenous rituals of curing and exorcism, shares the common Buddhist goal of individual release from suffering and the cycles of rebirth. The religion holds that salvation, in the sense of release from the cycle of rebirth, can be achieved through the intercession of compassionate Buddhas who have delayed their own entry to the state of selfless bliss (nirvana) to save others. Such Buddhas, who also manifest as bodhisattvas, are not treated a deities in a polytheistic sense, but rise as enlightened beings in a universe of humans, mundane deities, opposing demons, converted and reformed demons and wandering ghosts of the regions into which Buddhism expanded. Tantrism contributed esoteric techniques of meditation and a repertoire of sacred icons, phrases and mudra that easily lent themselves to pragmatic (rather than transcendental) and magical interpretation. Tibetan Buddhism posits progressive stages of enlightenment and comprehension of the reality underlying the illusions that hamper the understanding and perceptions of those not trained in meditation or Buddhist doctrine, with sacred symbols interpreted in increasingly abstract terms. A ritual that appears to a common yak herder as a straightforward exorcism of disease demons could be interpreted by a senior monk as a representation of conflicting tendencies in the mind of a meditating ascetic. In Tibet Buddhism thus became an amalgam, combining colorful popular ceremonies and curing rituals for the masses with the rigorous academic studies of Buddhist canon in the monasteries. The basic Buddhist tenet of reincarnation was combined with the Tantric idea that Buddhahood could be achieved within a person's lifetime to produce a category of leaders who were considered to have achieved Buddhahood and to be the reincarnations of previous leaders. These leaders, referred to as tulkus, held secular power and supervised a body of ordinary monks or lamas (Wylie: bla ma "revered one)". The monks were supported by the laity, who thereby gained merit and who received from the monks instructions in the rudiments of the faith and monastic services in healing, divination, and funerals. Though Tibetan influence is prevalent in Mongolia, Mongolian Buddhism is distinct and presents its own unique characteristics. The earliest introduction of Buddhism into the Mongolian steppes took place during the periods of pre-Mongol states. Buddhism penetrated Mongolia from Nepal via Central Asia. Many Buddhist terms of Sanskrit origin were adopted via the Sogdian language. The rulers of the pre- and para-Mongol states such as the Xiongnu, Xianbei, Rouran Khaganate and the Göktürks received missionaries and built temples for them. Buddhism prevailed among aristocrats and was patronised by the monarchs of the Northern Wei established by the Xianbei and of the Liao dynasty established by the Khitan people. The Khitan aristocracy regarded Buddhism as the culture of the Uyghur Khaganate that dominated the Mongolian steppes before the rise of the Khitans. The monarchs of the Jin established by the Jurchen people also regarded Buddhism as part of their Khitan. Tibetan Buddhist monasticism made an important impact on the early development of Mongolian Buddhism. The Buddhist monkhood has always played significant political roles in Central and Southeast Asia, and the sangha in Mongolia was no exception. Mongols assisted Tibetans in unifying the country. The activities of the Mongols were conducive to the prominency of the Sakya school and then the Gelug, and to the further development of Tibeto-Mongolian civilisation. Church and state supported each other, and the doctrine of reincarnation made it possible for the reincarnations of living Buddhas to be discovered conveniently in the families of Mongolian nobility until this practice was outlawed by the Qianlong Emperor of the Qing dynasty. By the beginning of the twentieth century, Outer Mongolia had 583 monasteries and temple complexes, which controlled an estimated 20 percent of the country's wealth. Almost all Mongolian cities have grown up on the sites of monasteries. Ikh Huree, as Ulaanbaatar was then known, was the seat of the preeminent living Buddha of Mongolia (the Jebtsundamba Khutuktu, also known as the Bogdo Gegen and later as the Bogd Khan), who ranked third in the ecclesiastical hierarchy after the Dalai Lama and the Panchen Lama. Two monasteries there contained approximately 13,000 and 7000 monks, respectively, and the pre-revolutionary name of the settlement known to outsiders as Urga, Ikh Huree, means "Big Monastery". Over the centuries, the monasteries acquired riches and secular dependents, gradually increasing their wealth and power as the wealth and power of the Mongol nobility declined. Some nobles donated a portion of their dependent families — people, rather than land, were the foundation of wealth and power in old Mongolia — to the monasteries. Some herders dedicated themselves and their families to serve the monasteries, either from piety or from the desire to escape the arbitrary exactions of the nobility. In some areas, the monasteries and their living buddhas (of whom there were a total of 140 in 1924) were also the secular authorities. In the 1920s, there were about 110,000 monks, including children, who made up about one-third of the male population, although many of these lived outside the monasteries and did not observe their vows. About 250,000 people, more than a third of the total population, either lived in territories administered by monasteries and living Buddhas or were hereditary dependents of the monasteries. With the end of Manchu rule in 1911, the Buddhist church and its clergy provided the only political structure available. The autonomous state thus took the form of a weakly centralized theocracy, headed by the Jebtsundamba Khutukhtu in Yehe Kuriye. By the twentieth century, Buddhism had penetrated deeply into the culture of Mongolia, and the populace willingly supported the lamas and the monasteries. 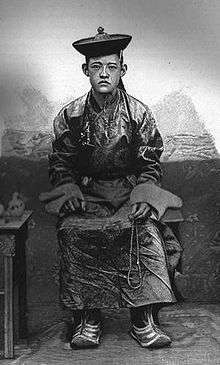 Foreign observers usually had a negative opinion of Mongolian monks, condemning them as lazy, ignorant, corrupt, and debauched, but the Mongolian people did not concur. Ordinary Mongolians apparently combined a cynical and realistic anticlericalism, sensitive to the faults and the human fallibility of individual monks or groups of monks, with a deep and unwavering concern for the transcendent values of the church. 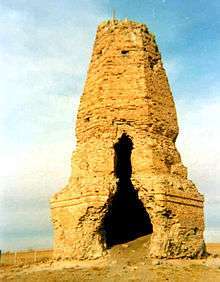 Ruins of the Ongiin Monastery, Saikhan-Ovoo, Dundgovi. When the revolutionaries took power, determined to modernize their country and to reform its society, they confronted a massive ecclesiastical structure that enrolled a larger part of the population, monopolized education and medical services, administered justice in a part of the country, and controlled a great deal of the national wealth. The Buddhist church, moreover, had no interest in reforming itself or in modernizing the country. The result was a protracted political struggle that absorbed the energies and attention of the party and its Soviet advisers for nearly twenty years. As late as 1934, the party counted 843 major Buddhist centers, about 3,000 temples of various sizes, and nearly 6000 associated buildings, which usually were the only fixed structures in a world of yurts. The annual income of the church was 31 million tögrögs, while that of the state was 37.5 million tögrögs. A party source claimed that, in 1935, monks constituted 48 percent of the adult male population. 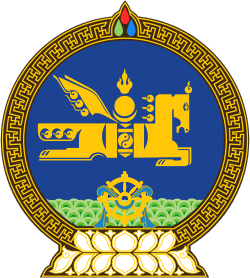 In a campaign marked by shifts of tactics, alternating between conciliation and persecution, and a few reported uprisings led by monks and abbots, the Buddhist church was removed progressively from public administration, was subjected to confiscatory taxes, was forbidden to teach children, and was prohibited from recruiting new monks or replacing living Buddhas. The campaign's timing matched the phases of Joseph Stalin's persecution of the Russian Orthodox Church. Robert Rupen reports that in the 1920s there were over 112,000 Mongolian Buddhist monks, representing more than 13% of Mongolia's overall population. By the 1940s, nearly every monk was either dead or had apostatized. In 1938 — amid accusations that the church and monasteries were trying to cooperate with the Japanese, who were promoting a pan-Mongol puppet state — the remaining monasteries were dissolved, their property was seized, and their monks were secularized, interned or executed. Those monastic buildings that had not been destroyed were taken over to serve as local government offices or schools. Only then was the ruling party, which since 1921 gradually had built a cadre of politically reliable and secularly educated administrators, able to destroy the church and to mobilize the country's wealth and population for its program of modernization and social change. Since the late 1940s, one monastery, Gandan Monastery, with a community of 100 monks, was open in Ulaanbaatar. It was the country's sole monastery and was more for international display than functionality. A few of the old monasteries survived as museums, and the Gandan Monastery served as a living museum and a tourist attraction. Its monks included a few young men who had undergone a five-year training period, but whose motives and mode of selection were unknown to Western observers. The party apparently thought that Buddhism no longer posed a challenge to its dominance and that — because Buddhism had played so large a part in the history of Mongolia and traditional arts and culture, total extirpation of knowledge about the religion and its practices would cut modern Mongols off from much of their past to the detriment of their national identity. A few aged former monks were employed to translate Tibetan-language handbooks on herbs and traditional Tibetan medicine. Government spokesmen described the monks of the Gandan Monastery as doing useful work. Today the monastery has been reinvigorated as Gandantegchinlen Monastery by the post-Communist governments of the country. Buddhism, furthermore played a role in Mongolia's foreign policy by linking Mongolia with the communist and the noncommunist states of East and Southeast Asia. Ulaanbaatar was the headquarters of the Asian Buddhist Conference for Peace, which has held conferences for Buddhists from such countries as Japan, Vietnam, Cambodia, Sri Lanka, and Bhutan; published a journal for international circulation; and maintained contacts with such groups as the Christian Peace Conference, the Soviet Afro-Asian Solidarity Committee and the Russian Orthodox Church. It sponsored the visits of the Dalai Lama to Mongolia in 1979 and 1982. The organization, headed by the abbot of then-Gandan Monastery, advanced the foreign policy goals of the Mongolian government, which were in accord with those of the Soviet Union. After the 1990 overthrow of communism, there has been a resurgence of Buddhism in the country, with about 200 temples now in existence and a monastic sangha of around 300 to 500 Mongolian monks and nuns. According to Vesna Wallace, a professor of religious studies at UC Santa Barbara: "Now more people are coming to temples and visiting monasteries. There is also a new interest in meditation among the general public." According to the national census of 2010, 53% of the Mongolians identify as Buddhists. ↑ Michael Jerryson, Mongolian Buddhism: The Rise and Fall of the Sangha, (Chiang Mai: Silkworm Books, 2007), 12. ↑ Michael Jerryson, Mongolian Buddhism: The Rise and Fall of the Sangha, (Chiang Mai: Silkworm Books, 2007), 90. ↑ Michael Jerryson, Mongolian Buddhism: The Rise and Fall of the Sangha, (Chiang Mai: Silkworm Books, 2007), 96. Buswell, Robert E., ed. (2004). "Mongolia", in: Encyclopedia of Buddhism. Macmillan Reference USA. pp. 561–565. ISBN 0-02-865718-7. 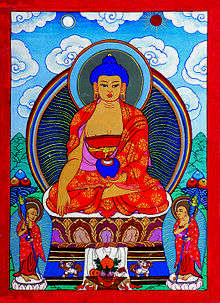 Wikimedia Commons has media related to Buddhism in Mongolia.